On 18th Oct 2012 the new hatchback from Honda is launched in 2 variants. One of it is Honda Brio V AT. Priced up to 6 lakhs, it is powered by 1198 cc, 1.2L SOCH i-VTEC Petrol Engine which can easily accelerate the power up to 88 PS @ 6000 rpm and the 109 Nm @ 4600 rpm. The mileage produced by Honda Brio V AT is of 12.5 kmpl on city roads and of 16.5 kmpl on highways. With it can reach from 0 to 100 km in15.8 secs and can even attain the highest speed of 156 kmph. This is due to electric power steering which is combined with 5 speed automatic transmission gear box to give a smooth and comfortable drive and a nice grip on road. The front chrome grille which is accompanied with the adjustable halogen headlamps and fog lamps style the car very well. The magnificent build of the car is worked upon a lot by the manufacturers to give something refreshing to the users. The body colored bumpers, door handles, tailgate handles and internally power adjustable ORVM increases the stylish looks of Honda Brio V AT. The steering wheel is multi-functioning and tilt adjustable to give a wonderful and relaxing drive. The powerful AC with heater is for all the weather purpose. The adjustable seats, power windows, good quality fabric upholstery give a sophisticated ambience to its interiors. This is followed by the hi-tech music system with AUX-IN and Bluetooth connectivity which makes the drive more soothing with the music of your choice. Safety is well maintained with features like ABS and EBD with brake assist, airbags on driver and co-driver’s side, center locking, seat belts and certain warning systems. The Honda Brio is safety features, great performance and excellent feature. 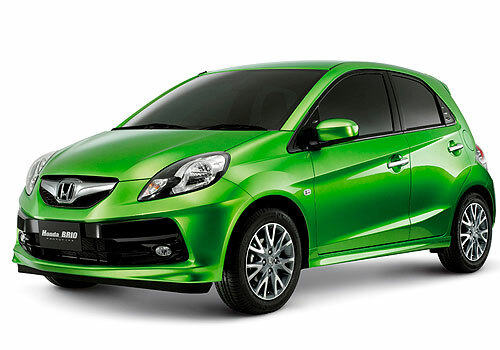 When will be come Honda Brio diesel version?